Has anyone seen Now You See Me 2 yet? We went to the theater a couple of weeks ago to see it for one of my daughter’s birthday presents. I absolutely loved the first movie, and the second one was pretty good, but I don’t think it measured up to the first one. That’s just one lady’s opinion, though. If you loved the first movie, I really do recommend the second one still! The one thing that really stuck out in the movie, in my mind anyway, was the awesome attention that they put on card tricks and illusions. I’ve always been fascinated by card tricks and illusions anyway, and the movie got me thinking about one playing card optical illusion in particular for some reason. Looks impossible, doesn’t it? You might be surprised to learn, though, that this is actually a really easy illusion to recreate! You can do it yourself with just a few carefully placed cuts and clever folds. Take a look at this video showing you just how to recreate this awesome playing card optical illusion. You can skip the intro and go to 1:10 in the video to get right to the instructions. See? How simple was that?! 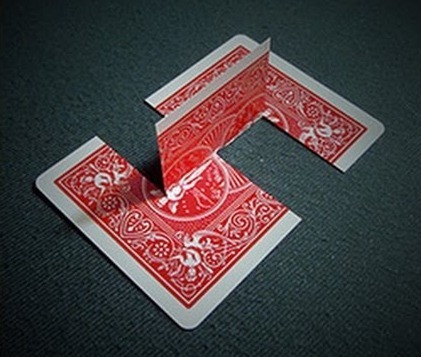 Now you have your very own playing card optical illusion to mess with people! If you liked this playing card optical illusion, you might want to check out this making of a hole optical illusion as well!